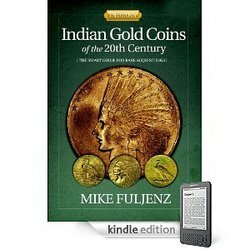 Subterfuge Publishing announces its Kindle release of the Numismatic Literary Guild's 2010 “Best Investment Book of the Year" winner "Indian Gold Coins of the 20th Century" by award-winning numismatic author, Mike Fuljenz. Subterfuge Publishing is proud to announce the release of a new book in Kindle format by Mike Fuljenz an award-winning numismatic author. Fuljenz’s new book is titled Indian Gold Coins of the 20th Century. In 2010 the book was awarded “Best Investment Book of the Year” by the Numismatic Literary Guild (NLG). This informative read provides an in-depth look at the history of the popular Indian Head design $2.50 ("Quarter Eagle"), $5 ("Half Eagle") and $10 ("Eagle") denomination gold coins, and provides useful information and expert advice for collecting these popular and beautiful numismatic rarities. The Kindle version of Mike Fuljenz’s book provides a needed resource to the thousands of coin collectors who collect and invest in 20th Century Indian Gold Coins. With the advent of Amazon’s e-book reader, coin collectors on the go can have their important numismatic resources, guides, and up to the minute market news right at their fingertip. Collectors who buy the Kindle version of the book can now have a professional coin guide with them at coin shows, auctions, or when talking to a dealer. “It is not even necessary to buy the actual Kindle to view ‘Indian Gold Coins of the 20th Century,’ you simply need to download the free kindle applet from the Amazon Kindle store for the PC, Mac, Droid, Ipad, Iphone, or Ipod. With the free Kindle applet a coin collector can access comprehensive analysis and view amazing full color pictures of the coins that make up the 20th Century Indian Gold Coins, regardless of where they might be,” stated Mike Fuljenz. This 2010 NLG award winning reference book, “Indian Gold Coins of the 20th Century” by Mike Fuljenz provides a detailed, date-by-date analysis with color illustrations giving readers pertinent descriptions about the history of each date and mintmark as well as important comments about strike, luster, color and eye appeal. Fuljenz includes Overall Rarity and Uncirculated Rarity rankings tabulated from Numismatic Guaranty Corporation and Professional Coin Grading Service population reports for grades MS62 to MS65. There also are consumer education tips about protecting coins from theft, and the best ways to sell gold coins. Fuljenz examines the intriguing historical background and the controversies involved in the introduction of revolutionary new U.S. gold coin designs spurred by President Theodore Roosevelt in the early 20th century. The first production of Indian Head $10 coins in 1907 and early 1908 did not contain the motto, IN GOD WE TRUST, until Congress legislated its return. About Mike Fuljenz: Michael Fuljenz of Beaumont, TX serves on the board of directors of the Industry Council for Tangible Assets (ICTA). Since 1986 he has been the recipient of 35 national awards from the Numismatic Literary Guild (NLG) in ten different categories. Fuljenz has consulted with the US Mint, Federal Trade Commission, and the US Postal Service on consumer matters. Fuljenz has also appeared numerous times on CNBC, Bloomberg and Fox Business discussing subjects relating to coins, precious metals and consumer protection issues. About the Numismatic Literary Guild: Founded in 1968, the nonprofit Numismatic Literary Guild (NLG) annually present national awards to recognize outstanding journalism on the diverse subjects of money from ancient to modern. The members of the Numismatic Literary Guild are composed of the best authors, editors, columnist and publishers in the industry. Published by Subterfuge Publishing, Indian Gold Coins of the 20th Century by Mike Fuljenz (ISBN:10-0981948898) in Kindle format is available on Amazon.com.